We went. We saw. We asked. By now, no one should be surprised that Kanye West is a fan of President Donald Trump. It’s been months since he first posted a selfie wearing a “Make America Great Again” cap, so the surprise should be gone. recent remarks about repealing the 13th Amendment. But for many African Americans, the deeper question for West – or for anyone with melanin in their skin – is why. Why do you support Trump, given his offensive remarks, his silence on White nationalism, his rollbacks of Obama-era policies? What makes an African American put on a MAGA hat? What in the world are these Black folk thinking? 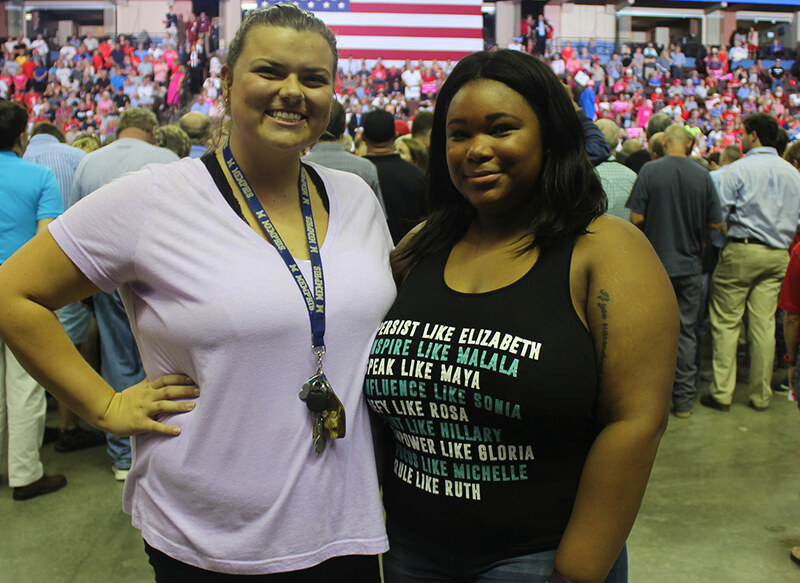 When I found out Trump would be at the Landers Center campaigning for Mississippi Senate hopeful Cindy Hyde-Smith, I decided to go find some African American Trump supporters and ask. And that’s how, in an election season punctuated by a bitter Senate battle for the Supreme Court, I found myself strolling into a “Make America Great Again” rally. No surprise, traffic was a mess on Church Road, with traffic backed up as early as 3 p.m. if not earlier. It was while I was stuck in traffic that I first saw some Black folk sporting Trump gear. They were selling it also. I saw at least three tents at that intersection, all staffed by African Americans displaying popular Trump-themed shirts. “Drain The Swamp!” and “Lock Her Up!” shirts were among the sure sellers. I was focused on parking and getting checked in, so I didn’t stop to talk to them. Plus, they looked busy. I’ll never know where they stand on Trump or his policies, but I couldn’t help believing that these vendors would be selling shirts regardless of the event. Whether it’s Trump 2020 or MLK50, the process is the same: put the design on the shirt, make the shirt, sell the shirt. Repeat. It’s just business. At the end of this sweaty October day, it was obvious that Trump represented a business opportunity for these entrepreneurs – and the hustle don’t stop for nobody. On this day at least, Donald Trump is simply good for business. Here’s what you should understand about Donald Trump and his popularity in Red State America: Remember how America (or the world, for that matter) was captivated by Trump’s predecessor, President Barack Obama? Remember Rev. Jesse Jackson crying when Obama was elected and how you felt Obama was going to get America back on the right track after eight years of George W. Bush? Well, that’s how Trump supporters feel about him. And it was palpable from the moment I walked into the Landers Center. But it was hard to conduct interviews, with the 80’s-heavy playlist that was blasting through the arena.. The playlist included plenty of Lionel Richie, a couple of songs by Michael Jackson, and Rihanna’s “Please Don’t Stop the Music.” They even played the long album-version of Prince’s Purple Rain – minus the violins. It wasn’t as heavy on country music as one would expect. If you’re carrying around an image of angry Trump voters, well there was no anger in the building. They were too happy to welcome their conquering hero. — President Trump in Southaven. By 3:30 or so, after I’d gotten checked in and cleared by the Secret Service, I made my way to the media area. It wasn’t until then that I learned that news media were confined to a very small area on the floor of the Landers Center. Despite me spotting a few specks of color in the then-sparse crowd, I was prohibited from leaving the media zone to go get interviews. That meant I had to wave people down and ask them to come chat with me. One of those people was Colin Richmond, a Memphis native and staunch Republican since 2000. Like many Republicans, Richmond likes Trump’s pro-business policies. Richmond’s positions have put him at odds with his parent’s generation. “I have an uncle who’s a radical Civil Rights activist. I love him dearly. He’s my mother’s brother. But he is sincerely wrong,” he said, without going into detail. “I never considered myself a minority but yeah, I was born to a single mother,” he added. “But at the same time, I learned that if I buy a widget for 50 cents and sell it for a dollar, I make a profit. It’s okay to make a profit. And I think a common misperception is that ‘profit’ is a dirty word. 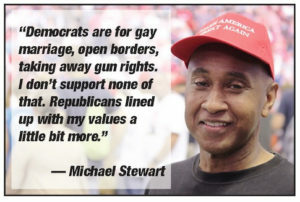 For Michael Stewart, the choice to register as a Republican was pretty simple – and pretty straightforward. A few minutes later, I spoke with Rev. Manuel Donis, a pastor who lives in Olive Branch. He joined the GOP in 2016 to support Ben Carson, but when Carson’s bid ended, he switched. As a preacher in the Bible Belt, Donis checks off the same boxes many other evangelical voters do. So what is it about Trump that he thinks most Black folk are missing? 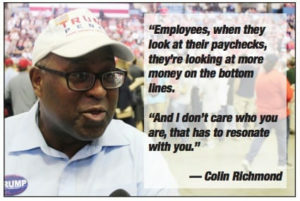 Donis thinks Trump is doing an “excellent job,” and believes that America’s booming economy will mean opportunity in the African American community – especially people with felony convictions. Nobody I spoke with denied that Trump says (and tweets) some outlandish things. But it wasn’t enough to drive them away. Taylor, who revealed he is biracial, is a strong supporter of Second Amendment rights and Trump’s immigration policy. Stewart said that often African Americans are too sensitive, allowing emotions to override logic. Which isn’t to say that there’s blind allegiance. If you’re wondering whether there were any African American women there, the answer is yes. But remember, I was confined and couldn’t just walk up to the handful of sisters I saw in the crowd. I did flag down two University of Memphis students – one African American, one White – and neither were Trump supporters. At just 19, both said it was their first time coming “to anything political” and for them, it was more of an academic exercise. 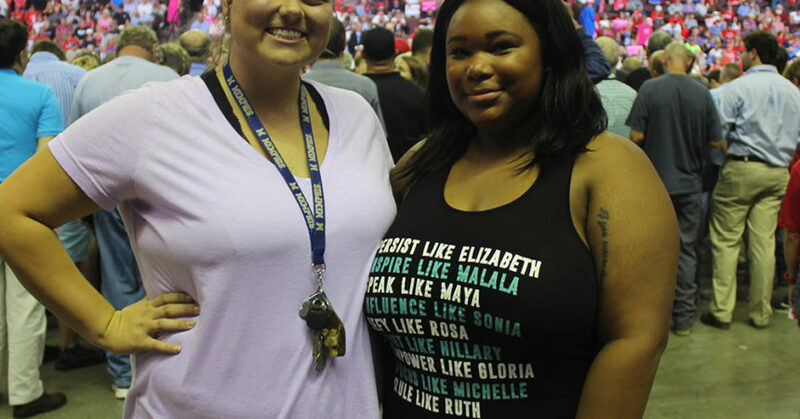 “I’m trying to be moderate and understand the way the right thinks and the way they interpret the things he’s going to say tonight,” said Tia Marshall, an African American sociology major. Both Marshall and Scarborough were too young to vote in 2016, but they’re all in for the 2018 midterms.